For other uses, see Moonrock. 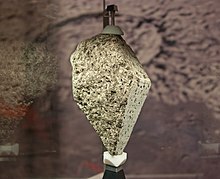 Moon rock or lunar rock is rock that is found on the Earth's moon including lunar material collected during the course of human exploration of the Moon, or rock that has been ejected naturally from the Moon's surface (and which has then landed on the Earth as meteorites). Moon rocks on Earth come from three sources: those collected by the United States Apollo program manned lunar landings from 1969 to 1972; samples returned by three Soviet Luna programme unmanned probes in the 1970s; and rocks that were ejected naturally from the lunar surface before falling to Earth as lunar meteorites. The Apollo missions collected 2,200 samples weighing 382 kilograms (842 lb). Three Luna spacecraft returned with 301 grams (10.6 oz) of samples. More than 300 lunar meteorites have been collected on Earth, representing more than 30 different meteorite finds (no falls), with a total mass of over 190 kilograms (420 lb). Some were discovered by scientific teams (such as ANSMET) searching for meteorites in Antarctica, with most of the remainder discovered by collectors in the desert regions of northern Africa and Oman. The Soviet Union attempted, but failed to make manned lunar landings in the 1970s, but they succeeded in landing three robotic Luna spacecraft with the capability to collect and return small samples to Earth. A combined total of less than half a kilogram of material was returned. In 1993, three small fragments from Luna 16, weighing 200 mg, were sold for US$ 442,500. Rocks from the Moon have been measured by radiometric dating techniques. They range in age from about 3.16 billion years old for the basaltic samples derived from the lunar maria, up to about 4.44 billion years old for rocks derived from the highlands. Based on the age-dating technique of "crater counting," the youngest basaltic eruptions are believed to have occurred about 1.2 billion years ago, but scientists do not possess samples of these lavas. In contrast, the oldest ages of rocks from the Earth are between 3.8 and 4.28 billion years old. Oxygen (O) White to transparent gray; usually as elongated grains. Oxygen (O) Maroon to black; the grains appear more elongated in the maria and more square in the highlands. Oxygen (O) Greenish color; generally, it appears in a rounded shape. Oxygen (O) Black, elongated square crystals. Moon rocks fall into two main categories: those found in the lunar highlands (terrae), and those in the maria. The terrae consist dominantly of mafic plutonic rocks. Regolith breccias with similar protoliths are also common. Mare basalts come in three distinct series in direct relation to their titanium content: high-Ti basalts, low-Ti basalts, and Very Low-Ti (VLT) basalts. Almost all lunar rocks are depleted in volatiles and are completely lacking in hydrated minerals common in Earth rocks. In some regards, lunar rocks are closely related to Earth's rocks in their isotopic composition of the element oxygen. The Apollo moon rocks were collected using a variety of tools, including hammers, rakes, scoops, tongs, and core tubes. Most were photographed prior to collection to record the condition in which they were found. They were placed inside sample bags and then a Special Environmental Sample Container for return to the Earth to protect them from contamination. In contrast to the Earth, large portions of the lunar crust appear to be composed of rocks with high concentrations of the mineral anorthite. The mare basalts have relatively high iron values. Furthermore, some of the mare basalts have very high levels of titanium (in the form of ilmenite). Primary igneous rocks in the lunar highlands compose three distinct groups: the ferroan anorthosite suite, the magnesian suite, and the alkali suite. Lunar breccias, formed largely by the immense basin-forming impacts, are dominantly composed of highland lithologies because most mare basalts post-date basin formation (and largely fill these impact basins). The ferroan anorthosite suite consists almost exclusively of the rock anorthosite (>90% calcic plagioclase) with less common anorthositic gabbro (70-80% calcic plagioclase, with minor pyroxene). The ferroan anorthosite suite is the most common group in the highlands, and is inferred to represent plagioclase flotation cumulates of the lunar magma ocean, with interstitial mafic phases formed from trapped interstitial melt or rafted upwards with the more abundant plagioclase framework. The plagioclase is extremely calcic by terrestrial standards, with molar anorthite contents of 94-96% (An94-96). This reflects the extreme depletion of the bulk moon in alkalis (Na, K) as well as water and other volatile elements. In contrast, the mafic minerals in this suite have low Mg/Fe ratios that are inconsistent with calcic plagioclase compositions. Ferroan anorthosites have been dated using the internal isochron method at "circa" 4.4 Ga. The magnesian suite (or "mg suite") consists of dunites (>90% olivine), troctolites (olivine-plagioclase), and gabbros (plagioclase-pyroxene) with relatively high Mg/Fe ratios in the mafic minerals and a range of plagioclase compositions that are still generally calcic (An86-93). These rocks represent later intrusions into the highlands crust (ferroan anorthosite) at round 4.3-4.1 Ga. An interesting aspect of this suite is that analysis of the trace element content of plagioclase and pyroxene require equilibrium with a KREEP-rich magma, despite the refractory major element contents. The alkali suite is so-called because of its high alkali content—for moon rocks. The alkali suite consists of alkali anorthosites with relatively sodic plagioclase (An70-85), norites (plagioclase-orthopyroxene), and gabbronorites (plagioclase-clinopyroxene-orthopyroxene) with similar plagioclase compositions and mafic minerals more iron-rich than the magnesian suite. The trace element contents of these minerals also indicates a KREEP-rich parent magma. The alkali suite spans an age range similar to the magnesian suite. Lunar granites are relatively rare rocks that include diorites, monzodiorites, and granophyres. They consist of quartz, plagioclase, orthoclase or alkali feldspar, rare mafics (pyroxene), and rare zircon. The alkali feldspar may have unusual compositions unlike any terrestrial feldspar, and they are often Ba-rich. These rocks apparently form by the extreme fractional crystallization of magnesian suite or alkali suite magmas, although liquid immiscibility may also play a role. U-Pb date of zircons from these rocks and from lunar soils have ages of 4.1-4.4 Ga, more or less the same as the magnesian suite and alkali suite rocks. In the 1960s, NASA researcher John A. O'Keefe and others linked lunar granites with tektites found on Earth although many researchers refuted these claims. According to one study, a portion of lunar sample 12013 has a chemistry that closely resembles javanite tektites found on Earth. Lunar breccias range from glassy vitrophyre melt rocks, to glass-rich breccia, to regolith breccias. The vitrophyres are dominantly glassy rocks that represent impact melt sheets that fill large impact structures. They contain few clasts of the target lithology, which is largely melted by the impact. Glassy breccias form from impact melt that exit the crater and entrain large volumes of crushed (but not melted) ejecta. It may contain abundant clasts that reflect the range of lithologies in the target region, sitting in a matrix of mineral fragments plus glass that welds it all together. Some of the clasts in these breccias are pieces of older breccias, documenting a repeated history of impact brecciation, cooling, and impact. Regolith breccias resemble the glassy breccias but have little or no glass (melt) to weld them together. As noted above, the basin-forming impacts responsible for these breccias pre-date almost all mare basalt volcanism, so clasts of mare basalt are very rare. When found, these clasts represent the earliest phase of mare basalt volcanism preserved. Mare basalts are named as such because they frequently constitute large portions of the lunar maria. These typically contain 18-21 percent FeO by weight, and 1-13 percent TiO2. They are similar to terrestrial basalts, but have many important differences; for example, mare basalts show a large negative europium anomaly. The type location is Mare Crisium sampled by Luna 24. KREEP Basalts (and borderline VHK (Very High K) basalts) have extraordinary potassium content. These contain 13-16 percent Al2O3, 9-15 percent FeO, and are enriched in magnesium and incompatible elements (potassium, phosphorus and rare earth elements) 100-150 times compared to ordinary chondrite meteorites. These are commonly encountered around the Oceanus Procellarum, and are identified in remote sensing by their high (about 10 ppm) thorium contents. Most of incompatible elements in KREEP basalts are incorporated in the grains of the phosphate minerals apatite and merrillite. Genesis Rock returned by the Apollo 15 mission. The main repository for the Apollo Moon rocks is the Lunar Sample Laboratory Facility at the Lyndon B. Johnson Space Center in Houston, Texas. For safe keeping, there is also a smaller collection stored at White Sands Test Facility in Las Cruces, New Mexico. Most of the rocks are stored in nitrogen to keep them free of moisture. They are handled only indirectly, using special tools. Moon rocks collected during the course of lunar exploration are currently considered priceless. In 2002, a safe was stolen from the Lunar Sample Building that contained minute samples of lunar and Martian material. The samples were recovered, and NASA estimated their value during the ensuing court case at about $1 million for 10 oz. (285 g) of material. Naturally transported Moon rocks in the form of lunar meteorites are sold and traded among private collectors. Apollo 17 astronauts Eugene Cernan and Harrison Schmitt picked up a rock "composed of many fragments, of many sizes, and many shapes, probably from all parts of the Moon". This rock was later labeled sample 70017. President Nixon ordered that fragments of that rock should be distributed in 1973 to all 50 US states and 135 foreign heads of state. The fragments were presented encased in an acrylic sphere, mounted on a wood plaque which included the recipients' flag which had also flown aboard Apollo 17. Many of the presentation Moon rocks are now unaccounted for, having been stolen or lost. Three minerals were discovered from the Moon. These include armalcolite, tranquillityite, and pyroxferroite. Armalcolite was named for the three astronauts on the Apollo 11 mission: Armstrong, Aldrin and Collins. Because of their rarity on Earth, and the difficulty of obtaining more, Moon rocks have been frequent targets of theft and vandalism, and many have gone missing or were stolen. A piece of regolith from Apollo 11 presented to the Soviet Union and exhibited in the Memorial Museum of Astronautics in Moscow. ^ "NASA Lunar Sample Laboratory Facility". NASA Curation Lunar. NASA. 1 September 2016. Archived from the original on 25 August 2018. Retrieved 13 October 2018. A total of 382 kilograms of lunar material, comprising 2200 individual specimens returned from the Moon, has been processed to meet scientific requirements into more than 110,000 individually cataloged samples. ^ "List of Lunar Meteorites - Feldspathic to Basaltic Order". meteorites.wustl.edu. Retrieved 30 March 2018. ^ "NASA - NSSDC - Spacecraft - Details". nssdc.gsfc.nasa.gov. Archived from the original on 2012-10-31. Retrieved 2015-11-08. ^ "NASA - NSSDC - Spacecraft - Details". nssdc.gsfc.nasa.gov. Archived from the original on 2013-02-24. Retrieved 2015-11-08. ^ "NASA - NSSDC - Spacecraft - Details". nssdc.gsfc.nasa.gov. Archived from the original on 2012-09-28. Retrieved 2015-11-08. ^ James Papike; Grahm Ryder & Charles Shearer (1998). "Lunar Samples". Reviews in Mineralogy and Geochemistry. 36: 5.1–5.234. ^ a b c "Exploring the Moon -- A Teacher's Guide with Activities, NASA EG-1997-10-116 - Rock ABCs Fact Sheet" (PDF). NASA. November 1997. Retrieved 19 January 2014. ^ Bhanoo, Sindya N. (28 December 2015). "New Type of Rock Is Discovered on Moon". New York Times. Retrieved 29 December 2015. ^ Wieczorek, Mark; Jolliff, Bradley; Khan, Amir; et al. (2006). "The Constitution and Structure of the Lunar Interior". Reviews in Mineralogy and Geochemistry. 60 (1): 221–364. Bibcode:2006RvMG...60..221W. doi:10.2138/rmg.2006.60.3. ^ Lucey, Paul; Korotev, Randy; Taylor, Larry; et al. (2006). "understanding the lunar surface and Space-Moon Interactions". Reviews in Mineralogy and Geochemistry. 60 (1): 100. Bibcode:2006RvMG...60...83L. doi:10.2138/rmg.2006.60.2. ^ Orloff, Richard W. (September 2004) [First published 2000]. "Extravehicular Activity". Apollo by the Numbers: A Statistical Reference. NASA History Division, Office of Policy and Plans. The NASA History Series. Washington, D.C.: NASA. ISBN 978-0-16-050631-4. LCCN 00061677. NASA SP-2000-4029. Retrieved August 1, 2013. ^ Astromaterials Research & Exploration Science. "70017 Ilmenite Basalt" (PDF). NASA. ^ "Where are the Apollo 17 Goodwill Moon Rocks?". Collect Space. Marc Norman (April 21, 2004). "The Oldest Moon Rocks". Planetary Science Research Discoveries. 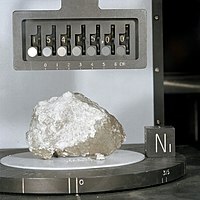 Wikimedia Commons has media related to Lunar samples.